This photo is an example. 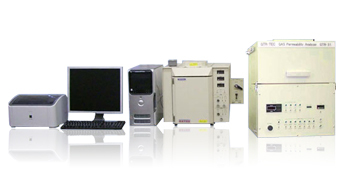 This system complies with ISO 15105-1 and JIS K7126. It is designed for dry gases, such as H2, O2, CO2 or blended gases. It injects the permeate of test gases into the column of a gas chromatograph, separates them into each component, and calculates the gas permeability coefficient and transmission rate of the individual components. Measure the gas permeability coefficient of blended gases simultaneously. Copyright (C) GTR TEC Corporation. All Rights Reserved.